Many leaders are unaware of the amazing power of questions. Our conversations may be full of requests and demands, but all too often we are not asking for honest and informative answers, and we don’t know how to listen effectively to responses. When leaders start encouraging questions from their teams, however, they begin to see amazing results. Knowing the right questions to ask—and the right way to listen—will give any leader the skills to perform well in any situation, effectively communicate a vision to the team, and achieve lasting success across the organization. Thoroughly revised and updated, Leading with Questions will help you encourage participation and teamwork, foster outside-the-box thinking, empower others, build relationships with customers, solve problems, and more. Michael Marquardt reveals how to determine which questions will lead to solutions to even the most challenging issues. He outlines specific techniques of active listening and follow-up, and helps you understand how questions can improve the way you work with individuals, teams, and organizations. 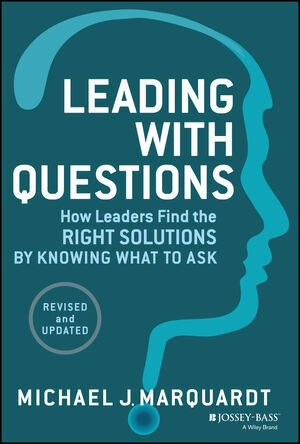 This new edition of Leading with Questions draws on interviews with thirty leaders, including eight whose stories are new to this edition. These interviews tell stories from a range of countries, including Singapore, Guyana, Korea, and Switzerland, and feature case studies from prominent firms such as DuPont, Alcoa, Novartis, and Cargill. A new chapter on problem-solving will help you apply questions to your toughest situations as a leader, and a new “Questions for Reflection” section at the end of each chapter will help you bring Marquardt’s message into all of your work as a leader. Now more than ever, Leading with Questions is the definitive guide for becoming a stronger leader by identifying—and asking—the right questions. Michael J. Marquardt is professor of Human Resource Development and International Affairs, as well as program director of the Executive Leadership Program at George Washington University. He also serves as president of the World Institute for Action Learning. Dr. Marquardt has trained more than 100,000 managers in nearly 150 countries at organizations including Marriott, Microsoft, Sony Music, Goodrich, Motorola, Nortel, Alcoa, Boeing, and Caterpillar, as well as the governments of Indonesia, Laos, Ethiopia, Zambia, Egypt, Kuwait, Saudi Arabia, Turkey, Russia, Jamaica, Honduras, and Swaziland. He is the author of twenty-four books and over one hundred professional articles in the fields of leadership, learning, globalization, and organizational change. Dr. Marquardt lives in the Washington, D.C. area and enjoys skiing, music, and traveling with his wife, four children, and nine grandchildren.